This badge was issued to MICHEL LUESCHER on 31 Oct 2012. 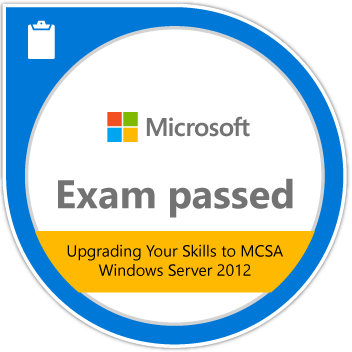 Passing Exam 417: Upgrading Your Skills to MCSA Windows Server 2012 validates the skills and knowledge required to implement the Windows Server 2012 core infrastructure services. Candidates have already earned a qualifying Windows Server 2008, Windows Server 2003, Windows Server 2000, or Windows XP certification.